Car interiors become hot and uncomfortable when exposed to the burning sun for too long, and you need to let the hot air out before you get in. 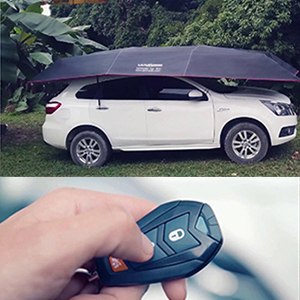 Now there is a car umbrella available that gives shade to the car while parked in the daylight! 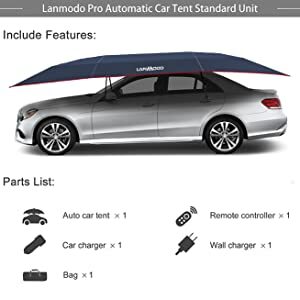 Lanmodo Pro car tent solves this problem because it gives shade to the entire body of the car and even protects your children from the heat. In hot weather, Lanmodo Pro can protect your car from hot heat and keep your car temperature lower up to 97°F / 36°C. 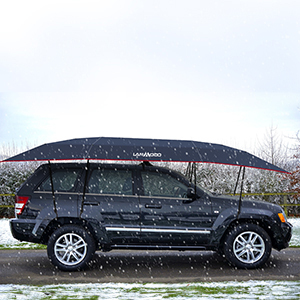 When winter is coming, you may need a anti-snow,water-proof car canopy to protect your car from possible damages,LANMODO car tent will be your best choice. Lanmodo automatic car tent works well in minus 20 ℃ environment,it shows that Lanmodo car tent can protect your car from snow.Get Lanmodo to make your car away from snow in cold winter. Please note:on a snowy day,this car tent can only prevent small snow,when the visible distance above 1000 meter,ground snow depth under 3cm/1.18inch. 1. 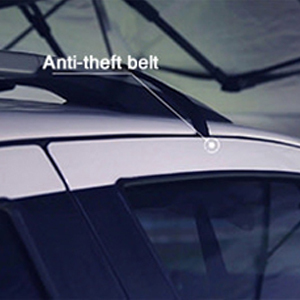 An anti-theft belt attached from suction base to from doors to keep Lanmodo Pro in safe. With steel wires inside, the belt can not be cut easily. 2. A remote control is used to open or close Lanmodo Pro car tent, if without it, the one can't use it.